(St. Joseph, Missouri and surrounding area). We are a territorial group in the Kingdom of Calontir for the Society for Creative Anachronism. Our "Known World" is an international organization that recreates all aspects of medieval and renaissance life from tournaments, arts, archery, feasts, and dancing just to name a few. Our focus is primarily on Europe and it's allies from approximately 600 CE to 1600CE. Please browse our site to see who we are, what we do, and what is happening locally & regionally. 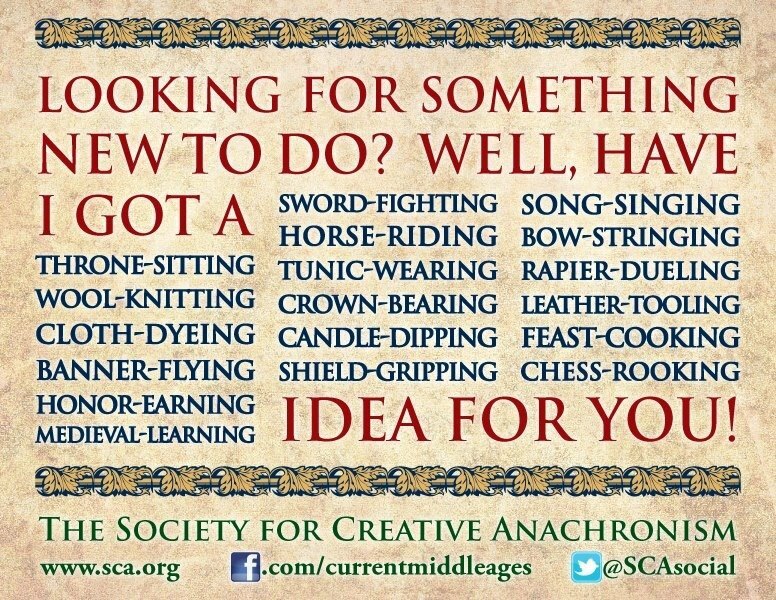 If you are new to our Shire or new to the SCA, please contact our Seneschal for an introduction! Please checkout "Meetings & News" for updates on our next business meetings and for current news on Fighter and Archery practices. Participants violating these rules are subject to appropriate sanctions. If an individual feels subjected to harassment, bullying or retaliation, they should contact a seneschal, President of the SCA, or the Kingdom's Board Ombudsman. If a participant of the SCA becomes aware that someone is being harassed or bullied, they have a responsibility pursuant to the SCA Code of Conduct to come forward and report this behavior to a seneschal, President of the SCA or Kingdom's Board Ombudsman. If you are subjected to harassment, bullying or retaliation, or if you become aware of anyone being harassed or bullied, contact a seneschal, President of the SCA, or your Kingdom's Board Ombudsman. You may also find the bullying and harassment statement here. This is the recognized web site for the Shire of Lost Moor of the Society for Creative Anachronism, Inc. and is maintained by the Shire's Webminister, Lord Halldór Skaptason. This site may contain electronic versions of the group's governing documents. Any discrepancies between the electronic version of any information on this site and the printed version that is available from the originating office will be decided in favor of the printed version. For information on using photographs, articles, or artwork from this web site, please contact the Webminister. He or she will assist you in contacting the original creator of the piece. Please respect the legal rights of our contributors. Copyright © 2005, 2006 - 2018 All rights reserved. Shire of Lost Moor. The original contributors retain the copyright of certain portions of this site.